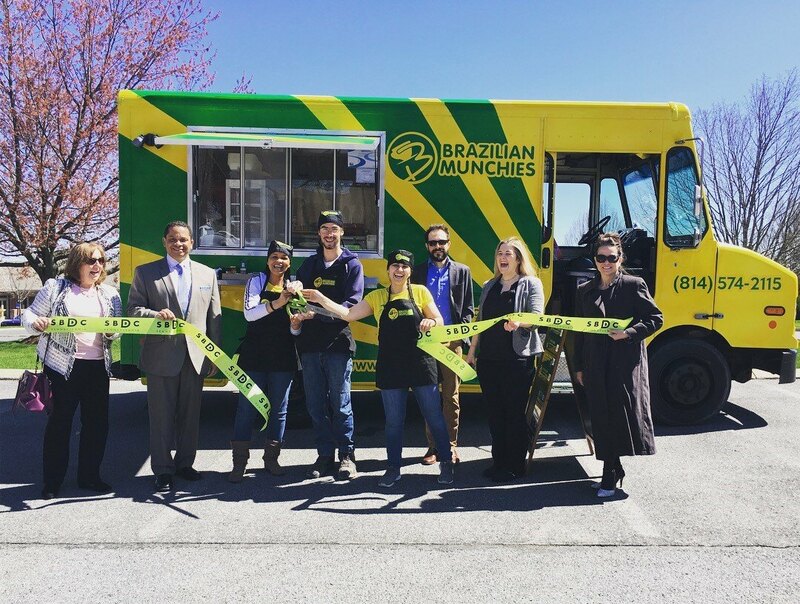 Flavia Barger, Nick Barger and Yamá Castilho (center) cut the SBDC ribbon for their business venture Brazilian Munchies along with Karan Waigand, U.S. Small Business Administration Pittsburgh District; Solomon Wheeler, U.S. Small Business Administration Eastern PA District (left) and Jennifer Riden, business consultant for the Penn State SBDC and Kimberlee MacMullen, director of the Penn State SBDC (right). Photo from Facebook. For those contemplating success in the entertainment capital, the panel offered real insight by industry insiders – Praveen Pandian, a television agent with Creative Artists Agency; Brittany Lentz, an account director with IMRE, a marketing communications agency with expertise in social, digital, creative, public relations and paid media; and Austin Sepulveda, the founder of Watchmakers Entertainment. A good‑sized crowd gathered to hear the insights of the panelists on the expectations and the reality of launching a career in the entertainment industry. Picking up on this thread, Ms. Lentz highlighted the importance of networking and contacts in the industry. “There are many people with a lot of talent and good ideas, but if they don’t know how to put those ideas and talent forward, they are never going to get anywhere.” She noted that the rise of social media has made it much easier for budding entrepreneurs to reach out into the marketplace, but unless they have the expertise and guidance to effectively target and reach their audience, whether it be a large group or one individual, their efforts will be unsuccessful. “This is a business of people and relationships. It is also an open business. So the person with a good idea can get ahead if they know how to move forward.” She noted that ideas sell in Hollywood and the artistic entrepreneur must be willing to sell themselves, rather than waiting to be discovered.